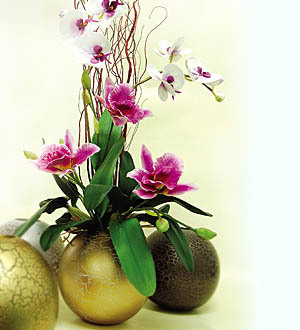 A dramatic fusion of white Phalaenopsis and purple Cattleyas in a stylish Ulik mango wood vase (18.5cm dia.) with gold etchings. Measures approx 80cm. Vase available in white, copper, gold (as seen in picture) and husk brown.